Everything was perfect. The location was great. Is close to the main street in Mathon, which is a quiet place, between Ischgl and Galtur, 3-4 minutes max. by car to both of them. The apartment was super. It looked just like advertised, super clean, with a lot of amenities. It had separate bathroom and toilet, towels for all the persons, showergel, body lotion, vanity kit, even a sowing kit. The kitchen had everything just like at home, plates, cutlery, pots, coffee maker, toaster, microwave, stove, even a dish washer. The terrace was really big and had a big table and chairs if you wanted to stay outside. The parking space inside the underground parking is an advantage, especially in the winter. And the host, Stefanie is a wonderful person, always available, super nice and helpful. She gave us great tips on where we could eat and walk around. She even baked us a cake one day. We love her. We definitely recommend Chasa Allegria and we are planning on returning there. 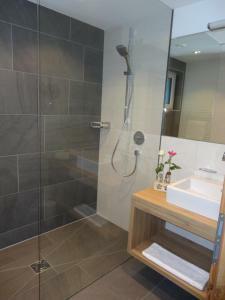 Very nice, clean and new accomodation in Mathon. Very friendly host, great sauna and short walk to ski bus stop. The place is shining clean. Apartment was very nice. Very nice Sauna-area downstairs. 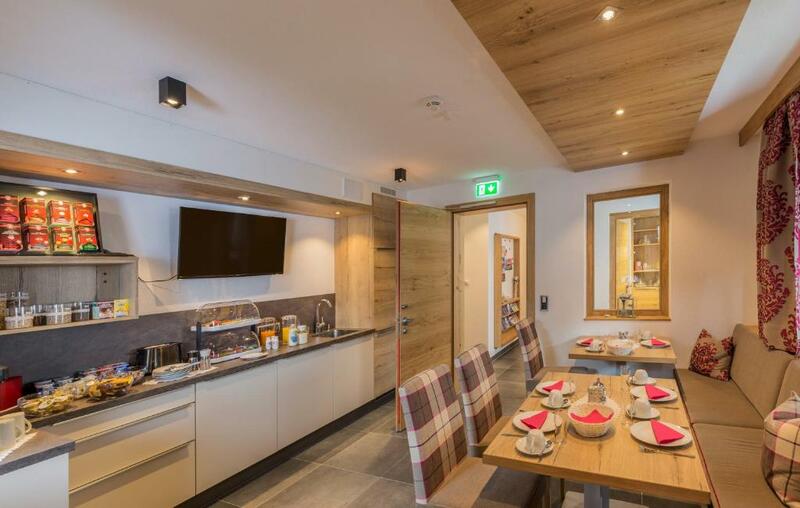 There are not many apartments in this hotell so Sauna area was in our groups private use. Mathon is peaceful. Excellent restaurant next to hotell. Hotell has lockers to your ski equipment in Ischgl so you don't have to carry your skis around. This is excellent feature. Great host and great location. The bus stop to ischgyl is just a short walk and you get lockers at the base of the gondola station to store your boots and skis. The steam bath and sauna are excellent as well. Everything again wonderfull. Superior appartment with a perfect hostess. Thanks stefani for all care and help. We definitly return next year. Tolle Ausstattung, Top Sauberkeit, tolle Gastgeber,- Herz und Seele des Hauses ist die Stefanie, die wirklich versucht, jeden Wunsch, den man hat, zu erfüllen - Klasse !!!! Ruime, lichte en kraaknette kamers. Super bedden. Keuken volledig uitgerust en als nieuw. Vlotte en zeer vriendelijke ontvangst door Steffi. Zeer welkome wellness na het skieën. Wir waren begeistert von der Herzlichkeit die die Gastgeberin Steffi ausstrahlt und lebt. Man fühlt sich von der ersten Minute wohl. 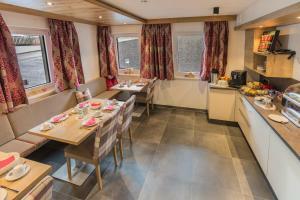 Das Haus ist Tip-Top sauber und sehr stilvoll eingerichtet - mit Liebe zum Detail! Auch das Frühstück war so unglaublich liebevoll vorbereitet. Wir wollen auf jeden Fall mal wieder kommen!! 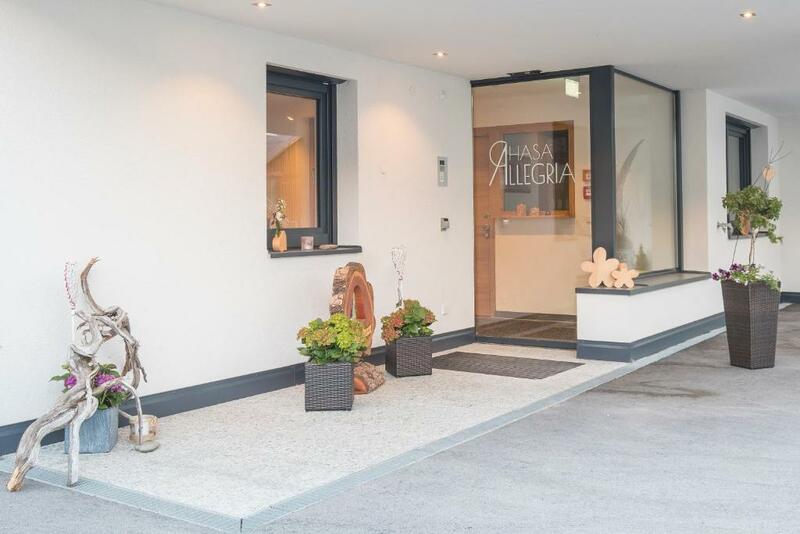 Lock in a great price for Chasa Allegria – rated 9.6 by recent guests! One of our best sellers in Ischgl! Built in 2015, the modern Chasa Allegria enjoys a quiet location in Mathon, 2.5 mi from the center of Ischgl. 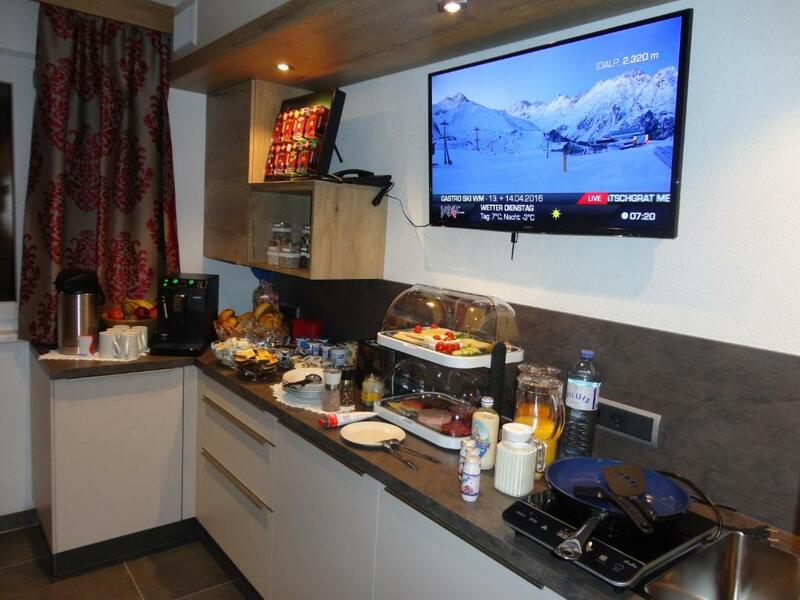 It offers panoramic views of the surrounding mountains, free WiFi, and free private parking. Free use of the sauna, steam bath, and infrared cabin is available in the winter season. 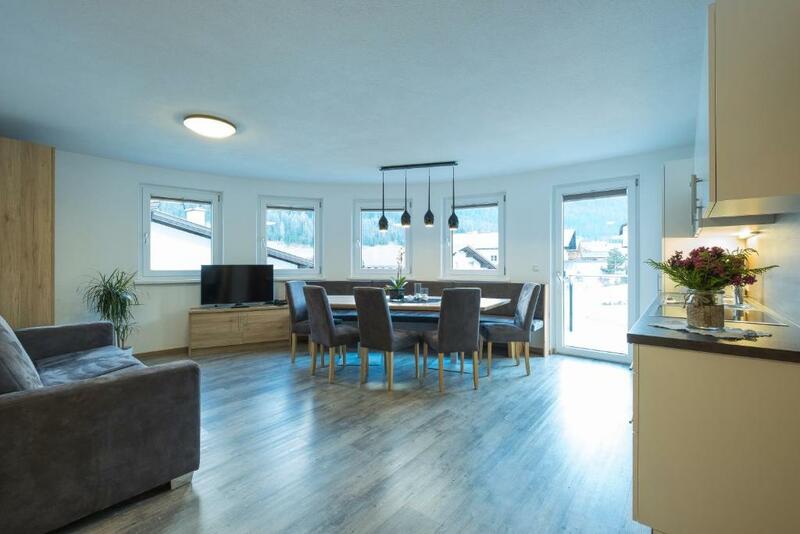 All apartments at Chasa Allegria feature undefloor heating. On request, fresh bread rolls can be delivered every morning. All apartments and facilities at Chasa Allegria can be reached by elevator. The free ski bus to Ischgl stops only 150 feet away. The ride only takes 3 to 4 minutes, and there are around 40 connections every day. Mathon is a great choice for travelers interested in snowboarding, nature and downhill skiing. When would you like to stay at Chasa Allegria? Room with a small balcony, a flat-screen TV, underfloor heating and a bathroom with shower and toilet. This apartment features a toaster, oven and dishwasher. Das 2015 erbaute und top moderne Chasa Allegria erwartet Sie in sonniger und ruhiger Lage mit herrlichem Ausblick auf die umliegenden Berge. Das Zentrum von Ischgl & und die Seilbahnen erreichen Sie in nur wenigen Minuten mit dem Skibus. Appartements und alle Einrichtungen des Hotels erreichen Sie direkt mit dem Aufzug. Auf Anfrage werden Ihnen morgens frische Brötchen geliefert. In der Wintersaison lädt unser Wellnessbereich mit Sauna, Dampfbad & Infrarotkabine zum Entspannen ein! In den Sommermonaten ist der Wellnessbereich geschlossen. Wir - Stefanie & Andreas Walser freuen uns schon sehr Sie bei uns begrüßen zu dürfen! Wir sind bemüht Ihnen ihren Aufenthalt so angenehm wie möglich zu gestalten damit Sie sich auch in ihrem Urlaubsdomizil wie zu Hause fühlen können. Der kostenfreie Skibus hält nur 50 m (Haltestelle Mathon-West) entfernt. Sie erwarten täglich ca.40 Verbindungen zu den Seilbahnen in Ischgl und wieder zurück, wobei die Fahrt 3 bis 4 Minuten dauert. Restaurants und die Bäckerei von Mathon befindet sich in unmittelbarer Nähe. House Rules Chasa Allegria takes special requests – add in the next step! Chasa Allegria accepts these cards and reserves the right to temporarily hold an amount prior to arrival. Please inform Chasa Allegria of your expected arrival time in advance. You can use the Special Requests box when booking, or contact the property directly using the contact details in your confirmation. 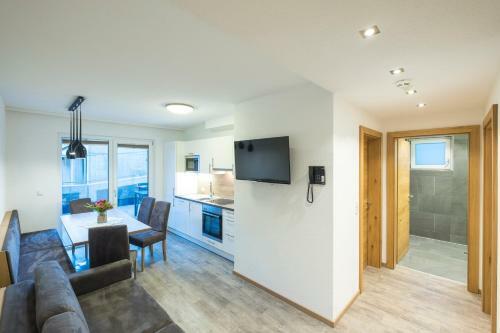 Mathon is about 5 km from Ischgl and ski lifts so you need always go by car, bus or taxi. In Mathon there is not that many services available but knowing that it didn't matter to travel few minutes there and back. Price is a bit on the high side. A bit away from Ischgl but good bus connections take you to Ischgl or back in few minutes during daytime. Buses are crowded in the morning and in the afternoon. the living room could be more cosy.